New.Old.Stock. 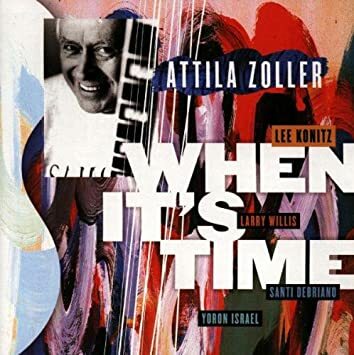 | A guitar music blog. …was the last time I posted. Ugh. My blog is at risk of becoming another neglected piece of real estate in the ever-expanding digital wasteland. I actually haven’t given up on guitar blogging. I’m in the time-consuming closing stages of a Ph.D. dissertation — the subject of which unfortunately has nothing to do with music. Fear not though, close friends of the blog. My defense is officially set for July and after that I will have newfound bandwidth for all things guitar. Come August/September, you can look forward to more gear and music reviews, projects, and hopefully some new features accompanying an overall revamping of the NewOldStock experience. In the meantime, enjoy this clip from Julian Lage, who’s been touring (and allegedly recording) recently in a trio setting — with a super-hip Danocaster tele no less. I always look forward to new material from Julian, who isn’t afraid to experiment at the margins of jazz and Americana. I’ve made an effort to play more acoustic guitar in 2014, which has partly entailed overhauling my Martin D-28. Now a decade old, the spruce and rosewood dreadnought has matured both acoustically and aesthetically; it has also endured some normal wear and tear. Several months ago, I performed overdue maintenance on a worn mammoth ivory saddle. More recently, I set out to replace the stock Gotoh tuners (right) — at least one of which was showing symptoms of a stripped gear. The Martin-labeled enclosed machines are unfortunately not available through retailers (either singly or as a set), which means owners must navigate the myriad aftermarket options. A generic, Gotoh labeled drop-in replacement is available, but for several years I had been eyeing vintage-inspired, open-gear tuners. Open-gear tuners are stock on most high-end Martin vintage reproductions, and boutique manufacturers like Collings and Bourgeois also opt for the classic look. 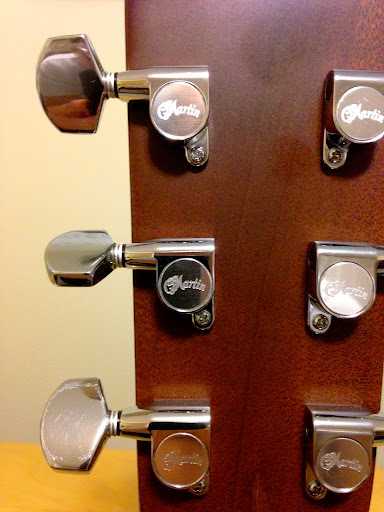 The problem is that open-gear tuners have a very different overall design footprint (including set screws and and peghead bushings) than most enclosed tuners — which is to say this is no trivial mod. After extensive research, I opted for a well-reviewed and reasonably priced set of Gotoh open-gear tuners available from Luthiers Mercantile International. Acoustic Guitar and Martin Guitar Forum users routinely compare these favorably to pricier, American-made models by Waverly. Installation can be daunting for the uninitiated, especially if it entails drilling and reaming holes in an expensive instrument. Needless to say, it’s a job worth taking to your luthier if you feel the least bit uncomfortable with the mod. For those who take the DIY route, I hope this post can serve as a helpful guide (this page and this page are also extremely helpful). I recently returned from a week in Beijing. 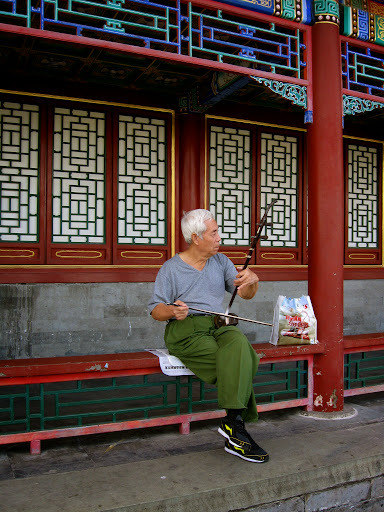 Hearing folks like this gentleman casually fiddling in parks and alleyways was a highlight. While out on the town one evening in the Houhai neighborhood, I was also heartened to see just about every bar on the lakeside strip featured a guitar-strumming songster or songstress. A local cover band was even belting out an admirable rendition of “Knockin’ on Heaven’s Door,” a la Guns N’ Roses. What’s that about a U.S.-China trade deficit? I guess some exports are less easily monetized. Local music shops were also packed full of guitars — mostly Asian brands like Fernandes, Ibanez, and Yamaha (not surprisingly), though one shop (below) boasted a sweet selection of Fenders. A luthier friend once had the opportunity to visit a Chinese guitar factory, where the guide noted the facility was cranking out several thousand instruments per day. Granted, most of those were probably destined for foreign markets (including the United States), but clearly a significant number of China’s youth share an affinity with Americans for all things guitar. I like to think that bodes well for U.S.-China relations; if nothing else, at least we can maybe agree that Use Your Illusion II was GNR’s high water mark. The title of Cahalen Morrison’s latest solo effort — The Flower of Muscle Shoals — implies a nostalgic tie to roots music history. Through his duo work with Eli West, Morrison has already demonstrated a reverence (and considerable talent) for acoustic Americana. The Flower of Muscle Shoals turns up the volume, augmenting Morrison’s gentle vocal twang with a rock-solid backing band easily at home in the diviest of honky-tonks. The Flower of Muscle Shoals is a deeply satisfying album, amply demonstrating this artist’s versatility and potential across a range of roots idioms. It’s also proof that great country & western music is still readily accessible — you just have to switch off the radio and tune in to the sounds of a true craftsman like Cahalen Morrison. Last year I posted about about my experience putting a range of low- and high-end picks through their paces. At the time, I commented about the dramatic price jump between manufactured picks and premium, handmade options. There just weren’t many choices in the consumer no-man’s land between $0.25 and $25.00. The folks at Dunlop Manufacturing have recently filled that void, and the results are impressive. Dunlop’s Primetone picks retail at about $6 street for a 3-pack, or $2 a pick. They are made of Dunlop’s tried and true “Ultex” material; I’ve been a fan of the translucent, heavy triangular Ultex picks for a while now. So what exactly merits the price jump for the Primetones? Dunlop cites the addition of “hand-burnished sculpted edges” — bevels designed to simulate the feel and speed of a well-worn plectrum; each bag of picks is initialed by the factory craftsman responsible for the burnishing. The Primetones are also significantly thicker, available in 1.4mm and 1.5mm (standard Ultex picks max out at 1.14mm). This is good news for acoustic flatpickers, who rely on heavy plectrums to coax as much volume and punch as possible from their dreadnoughts. In addition to several different shapes, the Dunlop Primetones are available in two different material consistencies — a translucent, tortoise shell-esque red color with a raised logo for better grip (512P, left image), and a more smoothly polished opaque finish (513P, right image). I ordered a package of triangular 1.5mm picks in each finish. The verdict? For flatpickers especially, the Primetones may be the best value-for-money on the market today. The 512P in particular held up nicely by comparison to premium-priced Wegen and Red Bear picks, offering crystal clear note articulation and plenty of volume on tap from my D-28. The raised grip and speed bevels made for a very comfortable playing experience. The 513P is a little mellower, trading some high end crispness for a more resounding bass thump — I found it particularly useful for jazz applications, when the treble from my humbucker-equipped Telecaster needs taming. I find myself increasingly defaulting to the Primetones as my go-to pick, and best of all I can lose one or two without tearing up at the replacement cost. Well done Dunlop. I’ve spent much of this summer on the road, travel-caster in tow. 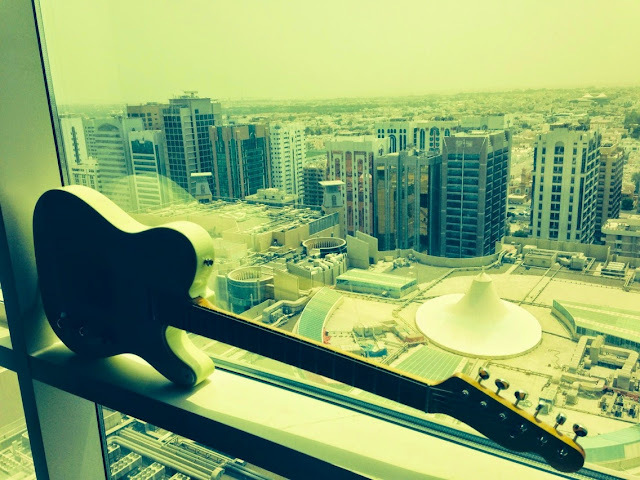 Abu Dhabi is probably the furthest afield I’ve huffed my tele. It’s a worthwhile diversion when venturing outside the hotel feels like waltzing face-first into a blast furnace. My post backlog is bursting at the seams. Coming attractions include the latest in premium plectrums, DIY pedal assembly, music reviews, and new vintage-style tuners for my Martin. Stay tuned, and stay cool! You did what to that guitar?! There’s a 1968 Telecaster currently for sale on reverb.com that, at first glance, exhibits serious mojo. The instrument is well-worn, Springsteen-style, with an aftermarket Charlie Christian-style neck pickup. CC pickups are hip, and ’68 teles aren’t all that rare, so I’m inclined to forgive the modding of a vintage piece. 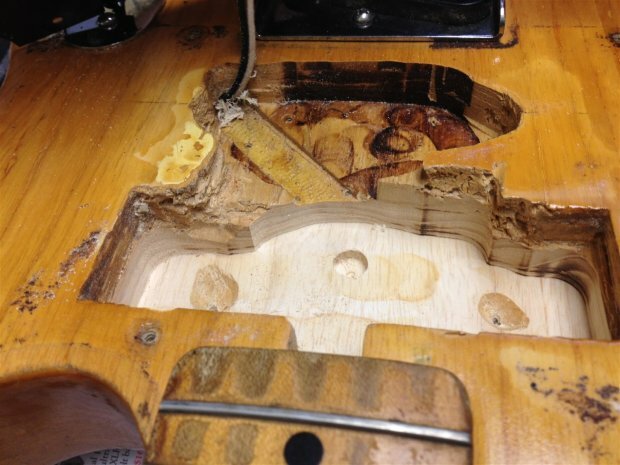 However, a glance through the photos accompanying the listing turns up a cringe-worthy pic of the routing job — the body was absolutely mangled to accommodate the pickup. They did what to that guitar?! Fellow pickers, let he (or she) who is without sin cast the first stone. I submit to you Exhibit A, my American Special Tele. 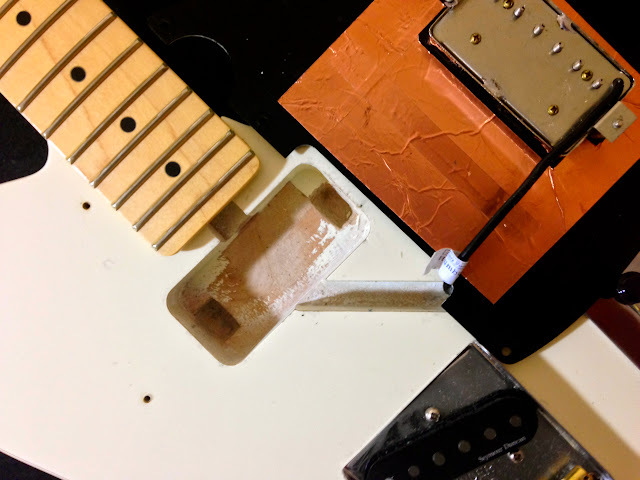 Three years ago I decided to install a PAF-style neck humbucker for jazz work, which the guitar was theoretically routed to accommodate. Upon receiving the pickup (a Duncan Seth Lover) in the mail, I was troubled to find that the factory route could not accommodate the pickup’s vintage-correct elevated mounting tabs. A wiser man would have returned the pickup and sought out a pickup with non-elevated tabs — or taken the guitar to a professional with the right tools for additional routing. But I want my jazz tone nooow. So out comes my electric drill and a wood chisel. Ouch. The job (consisting of two less-than-symmetrical routes on either side of the pickup cavity) isn’t nearly as ugly as the ’68, but I’m still not proud of the hasty workmanship. That said, the pickup fits now and everything is neatly hidden under the pickguard. A guitar without scars is a guitar that hasn’t been loved. Who am I to judge? I tend to stick to basics when it comes to guitar effects, but this latest offering from Electro-Harmonix — the “B9 Organ Machine” — looks pretty cool. While it’s no substitute for a righteous Hammond player, the sounds in the clip are still pretty convincing. Definitely an intriguing option for adding something different to the mix. I’ve been on an organ combo kick for the past month or so, ever since catching Pat Martino’s trio at Birdland. 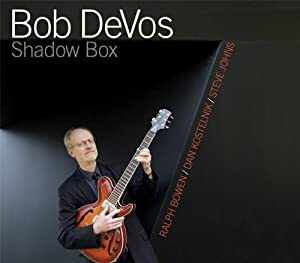 One of my favorite albums of 2014 so far is Shadow Box by Bob DeVos, which blends old school soul jazz sounds with a more contemporary aesthetic. DeVos is a skillful bop-grounded improviser, but he’s also at home over a bluesy groove — check out the gospel-inflected “Basie in Mind,” one of the standouts from Shadow Box. Last week I posted about my decision to jump headfirst into the world of amp mods, performing some simple tweaks to my Fender Blues Jr using a popular kit from online Jr guru Bill Machrone. This included the “TwinStack” mod, replacement orange drop tone capacitors, power supply stiffening capacitor, and adjustable bias trim pot, as well as a presence control and more robust input jack. Sounds complicated, but in reality the mods involve only a handful of components. What could go wrong? N.O.S. – A guitar music blog. 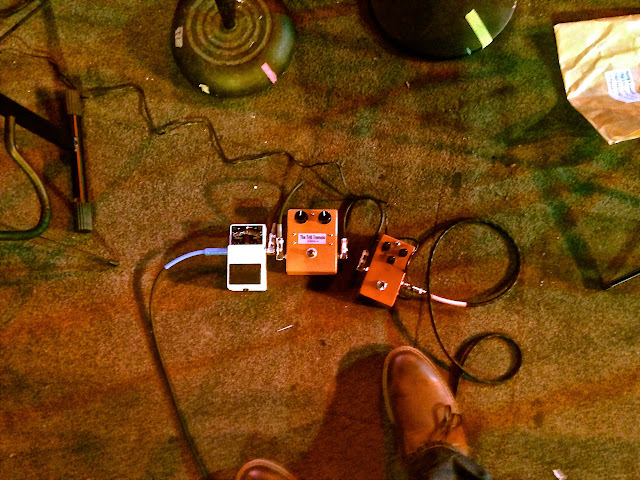 A blog about guitars, guitarists, and guitar music.